Description: The Caldwell AR Mag Charger revolutionizes the way ammo is handled and loaded into AR-15 magazines. 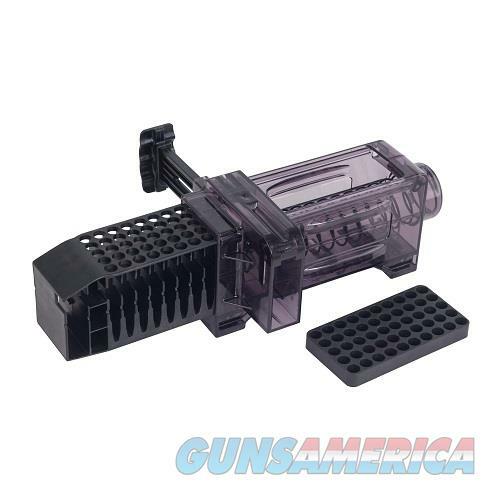 It is designed to accept 50 loaded rounds directly from any common 50 round ammo manufacturer box or aftermarket 50 round plastic storage boxes. Simply align bullet tips and dump a box of ammo into the Mag Charger. The ammo is automatically aligned without touching a single round. Once filled with ammo, inset any AR magazine into the Mag Charger just as you would a rifle. The actuate the plunger back and forth loading 5 rounds per stroke as the spring loaded ammo carrier automatically advances aligning the next five rounds until magazine is fully loaded. The entire process of filling the Mag Charger with ammo and loading all 50 rounds into two magazines takes less than 15 seconds!